True to its reputation of being a company that believes in innovation and innovative techniques, Stoker Concast (P) Ltd has once again taken the lead. In the first of its kind, we have developed and successfully launched a versatile machine that can cast horizontally and vertically simultaneously. 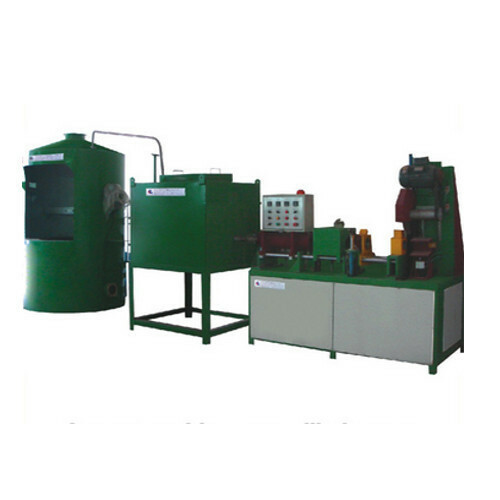 While the vertical caster is in use for casting rods for the wire industry, or for casting thin walled tubes for refrigeration and in the automobile bush industries, the horizontal mode can be used for casting larger sections of billet , thick walled tubes for extrusion press or casting strips for bus bar industries. The scope of casting is significantly increased through simultaneous use of horizontal and vertical casters. The process economises on both labour and time. The crucible can be 100% emptied out by casting horizontally, thereby saving precious metal ( in the traditional machine this is dumped as scrap). There is a drastic reduction in cooling time, thereby increasing the crucible life. Started in 1993, STOKER CONCAST has come a long way since then. The company that had originated as a manufacturer of simple horizontal continuous casting machines has now metamorphosed into a company whose strength lies in its innovative technological approach and constant upgradation of its designs and products with users across the globe.